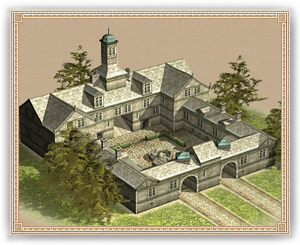 An Alchemy School can upgrade the weapons of any gunpowder-using unit, as well as improve the education of characters created here. A University can upgrade the weapons of any artillery or gunpowder-using unit, as well as offer a superior education to characters created here. The art of alchemy is a dangerous one, where the practitioners expose themselves to great risk by performing hazardous experiments in either the name of science, or greed. With the inherent risks involved dealing with dangerous compounds, the Alchemist’s Lab serves as a place to for scholarly types to conduct tests in relative safety, as well as share their findings with one another to further the art.